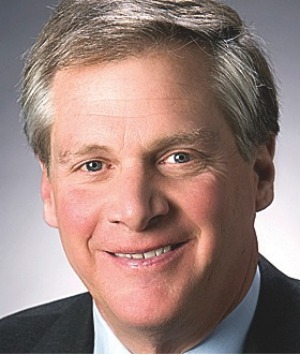 Doug Oberhelman was elected a vice president in 1995, serving as Caterpillar's chief financial officer with administrative responsibility for the corporation's accounting, information services, tax, treasury, investor relations and marketing support services areas from 1995 to November 1998. In 1998, he became the vice president with responsibility for the Engine Products Division, including the market development, strategic planning, supplier management, electric power generation and worldwide marketing and administration for Caterpillar's engine business. Oberhelman was elected a group president and member of Caterpillar's executive office in 2002. As a group president, he had responsibility for financial products, legal services, auditing & compliance, global purchasing, human services, remanufacturing, corporate treasury, tax, and investor relations. His responsibilities also included marketing, rail, energy and power systems businesses, as well as marketing, manufacturing and sales operations in Asia Pacific and Japan. In October 2009, the Caterpillar Board of Directors named Oberhelman vice chairman and CEO-Elect. During this time, he led a team that developed the future strategic plan for the company. Oberhelman was elected chief executive officer and a member of the Board of Directors effective July 1, 2010, and became chairman effective November 1, 2010. Oberhelman has a bachelor's degree in finance from Millikin University. He is currently a director for the boards of Eli Lilly and Company, serving on the Audit and Finance Committees, the National Association of Manufacturers, serving as vice chairman and Finance Committee chair, and the Wetlands America Trust. He is active with The Nature Conservancy serving on the Latin American Conservation Council and on the board of the Illinois Chapter. Oberhelman is also a member of The Business Council and the Business Roundtable where he serves on the Executive Committee and as chair of the International Engagement Committee. He has served as chairman of the board of trustees for Millikin University and chairman of the board of directors for Easter Seals. He is a former director for the board of Ameren Corporation, where he served as chairman of the Ameren Corporation Audit Committee and a member of the Nominating and Governance Committee and the Public Policy Committee. Oberhelman is also a former director for the boards of South Side Bank, Millikin University and Easter Seals. "Doug Oberhelman was a powerful, powerful speaker! We want to have him back. That is how much we appreciate him."